Striped Maple (Acer pensylvanicum), also known as Moosewood and Moose Maple, can easily be identified summer or winter by its greenish bark bearing vertical white stripes (hence, its common name). Because the bark is so distinctive, one needn’t rely on Striped Maple’s buds for identification purposes, but they are well worth investigating, nonetheless. 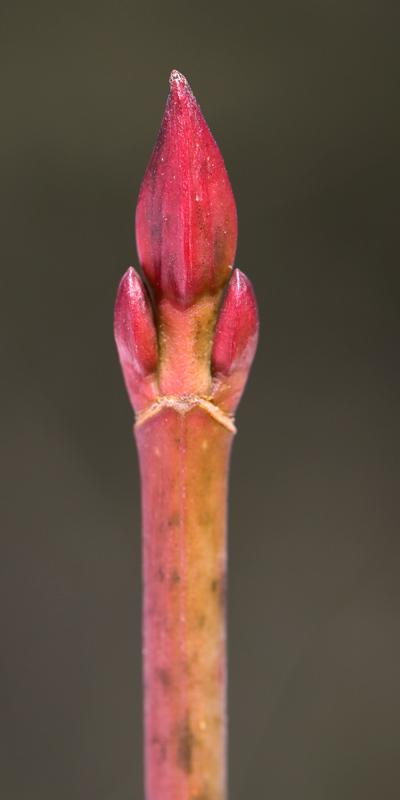 Their graceful shape, smooth surface (few bud scales) and pinkish-red coloration distinguish them from all others. These buds and young branches that bear them are devoured by rabbits and hares, are frequently eaten by porcupines and beavers, and provide browse for deer and moose. This entry was posted on March 11, 2014 by Mary Holland. It was filed under Bark, Deciduous Trees, Flowering Plants, Maples, March, Striped Maple, Tree Buds, Tree Identification, Trees, Woody Plants and was tagged with Acer, Acer pensylvanicum. Great photo – nature is so artful. Thanks, Eliza. Yes, it is, indeed! Fascinating! I had never heard this before.